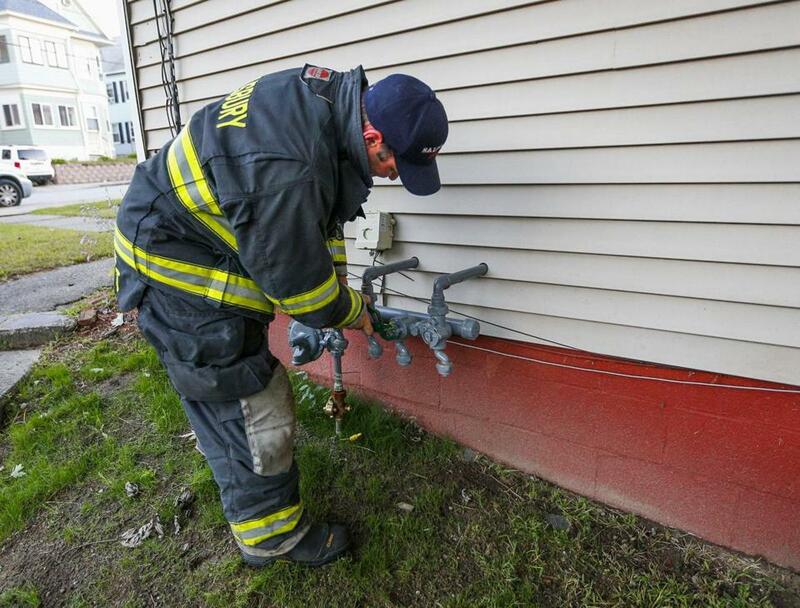 A Salsbury Fire Department fireman turned off gas to a house in Lawrence. State Police advised residents in Andover, Lawrence, and North Andover who get their gas service from Columbia Gas of Massachusetts to evacuate their homes immediately Thursday afternoon after dozens of fires broke out. Also, National Grid is cutting off electric power to the three communities to assist authorities, the Massachusetts State Police reported. Columbia Gas provides natural gas service to more than 50,000 customers in the Merrimack Valley, including in neighboring Methuen and Haverhill, according to its website. A press release published Thursday on Columbia Gas’s website announced a slew of ongoing and upcoming work to upgrade natural gas lines and improve service, including four ongoing projects in Andover, three in Lawrence, and two in North Andover. Last month, service was interrupted for about 250 customers in Lawrence after a third-party company struck a line, Columbia Gas reported on its website. The company was previously known as Bay State Gas and merged with the big Indiana utility NiSource Inc., in 2000. A corporate reorganization in 2010 resulted in Bay State Gas and other NiSource gas operations unified under the Columbia Gas name. Columbia serves more than 150,000 additional customers in southeastern Massachusetts along with 100,000 more in the Springfield area, its website says. Statewide, about 90 percent of the company’s customers are residential; the rest are commercial.